Riveted Egg, made from hammer formed aluminum. 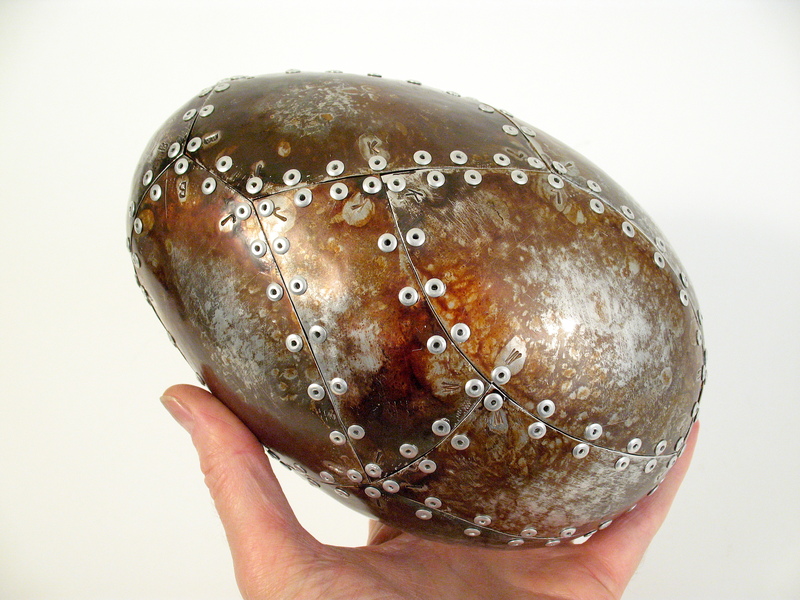 One of a kind egg sculpture made from hand-hammered aluminum with baked-on patina, fastened securely to an internal substructure with ~300 rivets. It’s alive! It can keep its balance due to “shake weights” I put inside…by shaking it gently to adjust the internal weights, you can get it to stand upright by itself on any flat surface, as seen in the photos. The internal weights also help it to stay put so it won’t roll around. This is one of the most challenging art objects I’ve ever made! First I made a full size version in wood, to which I carefully shape each aluminum section to fit the contours of the wooden form (aka buck). It’s definitely a one of a kind, because I cut the sections freehand, with no pattern or plan. Ditto for the patina — hand applied and manipulated — never the same twice. I used hardened steel alphabet punches to hand stamp letters into the corners of each plate, to help me put all the pieces back together again after the hot patina and burnishing stages. This looks like an A.I. (Artificial Intelligence) egg to me! When will A.I. hatch? In my lifetime? In yours? Crafted with care to last for many generations — I used heavy gauge (.040) aircraft grade aluminum for the shell — so it will most certainly be around when A.I. makes its grand entrance into human history. And once something hatches, there’s no putting the hatchling back in. This egg may not be sentient, but it still seems very much alive — in its motions, in its ability to hold a pose, the sounds it makes when shaken, and in its symbolism. I think it’s pretty safe to say you’ll never find anything else like it! Jewelry for the home. Or office. Or take it with you when you rocket to your new home on Mars.